If you just discovered this blog, this is Part 2 in a series on growing tomatoes in the home garden. Check out Part 1 here. Pruning tomatoes is key to healthy plants, which in turn increases production, decreases susceptibility to disease and makes fruit easier to harvest. 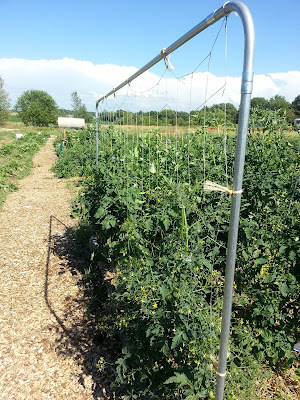 Pruning is particularly important for indeterminate tomatoes. (learn more about indeterminate tomatoes). Pruning helps direct energy from growing lots of leaves into fruit production, and helps with producing more, larger and earlier fruit. Sure, every plant needs leaves for photosynthesis, but not that many leaves. Tomatoes can get particularly leafy when presented with lots of nitrogen as well, so careful with the fertilizer. There are a number of soil- and air-borne diseases that you can minimize with proper pruning. Early blight is a soil-borne fungus that, when splashed up on leaves, will infect the plant. The good news is blight won't usually kill a plant, but will begin to defoliate the plant from the ground up and will compromise the plant's ability to produce lots of fruit. Pruning will also help with other air-borne diseases that require a moist, still environment to take hold on your tomato. Plants with dense foliage crammed into a tomato cage are just asking to harbor diseases such as fungus that like dark places. Tomato pruning can begin once a plant is established and has several sets of branches with leaves. As plants get larger, you need to be careful about how much you remove (it's also much more psychicly more difficult to do). And, a heavy pruning after fruit has set risks sun scalding the fruit (which would have toughened up with earlier pruning). 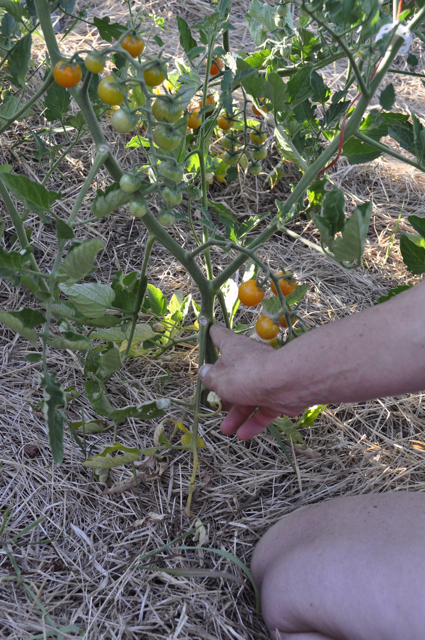 You don't need a fancy pruning tool for tomatoes. In fact, the best tool is already right in your hands. I snap branches and suckers off with my fingers. When I need to remove a particularly large branch, I use a simple scissors. The big picture here is that you want two main stems to have leaves and fruit. The plant in the image above shows a plant that has been pruned to allow the main stem and one sucker to grow, leaf and bear fruit. You can read more details about how to prune tomatoes on the Home-grown tomatoes for Wisconsin document. See page 3. This has been a great week of learning about gardening and what to do with the produce. On Tuesday, I spent a couple of hours with Megan and Claire from Madison FarmWorks talking about Solanaceae (everything but tomatoes), including peppers, potatoes, eggplant and tomatillos. Will write more about it just after I write about the great tomato class I took last week. 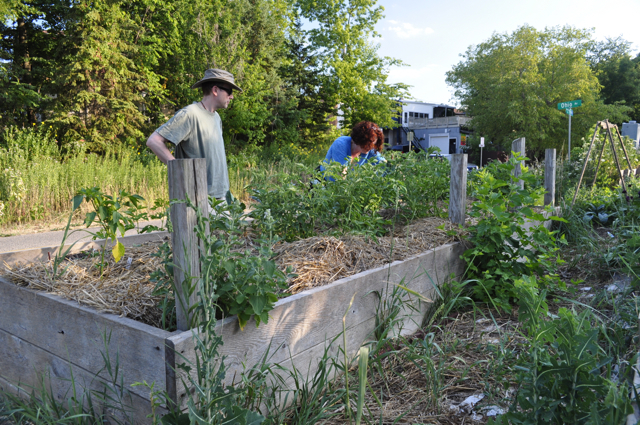 Thursday, Brian Hudelson, a UW-Extension plant disease expert, visited the American Family Community garden to see what he might find. The good news is there wasn't much disease in the garden, thanks to the dry weather we've had. I'll browse my notes to see what I can write here. Check out what Brian had to say about blossom-end-rot when he visited our gardens last year. I spent Thursday evening at a dehydration workshop put on by the Fair Share CSA Coalition. LOTS to write about from this one. Jay and I are signed up for two-class canning series. Jay is going to take the water-bath class for high-acid foods on Aug. 12 (4-7 p.m.) and I'm taking the pressure-canning class for low-acid foods on Aug. 26 (4-7:30 p.m.) You can learn more about these at http://www.csacoalition.org/our-work/food-use-preservation/. Phil Pellitteri. Bagels, coffee and juice will be provided. Please bring along your questions and specimens! RSVP to Michelle Shively 246-4730 ext 208. Save your spot today! 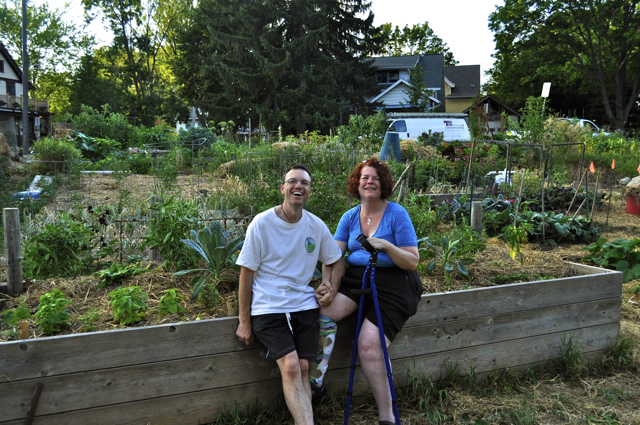 In mid-June, I helped my friend Tara wrestle a neglected mobility-accessible garden into submission. We won that first "Battle of the Weeds" (see blog post) and had a nice time connecting while we worked. 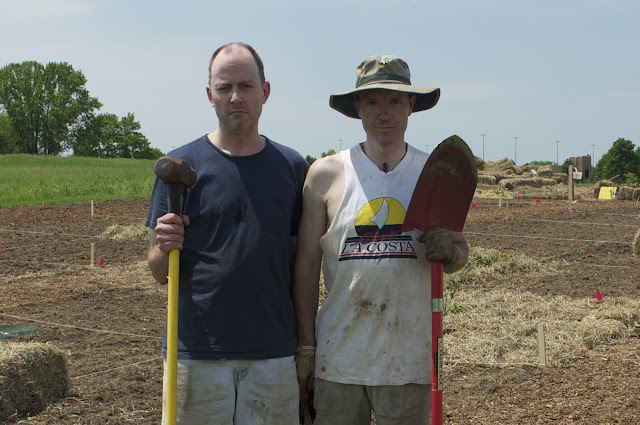 I wanted to see how the garden was progressing and reconnect with Tara, so Jay and I invited ourselves to visit her community garden bed. The heat had kept Tara away from the garden -- who didn't it keep out of the garden? But with the welcomed break in temperatures, the three of us went to see how it was doing. The bed didn't look anything like when we first planted it. The tomatoes were progressing nicely and there were peppers soon to be harvested. Tara also planted kale and basil (she kept nibbling on the kale during our time in the garden :) and we all removed basil flowers and kept "oohing" and "ahhhhing" at the heavenly scents our work released into the air. it's located just off a paved bike path (easy wheelchair access). it's located just off a road with parking, again, easy wheelchair access. 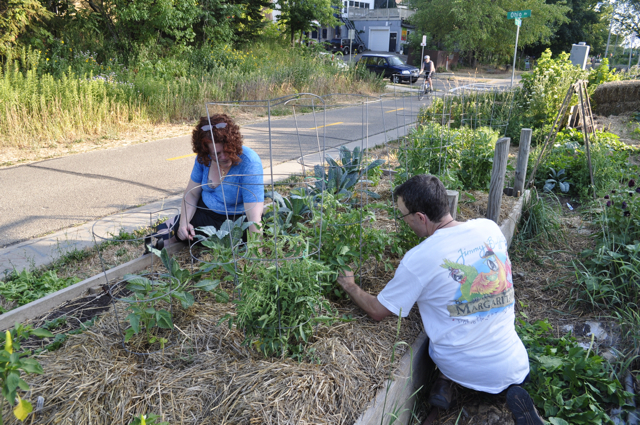 the garden is built up 36 inches on the bike path side, and 25 inches off the ground in the back (there is a bit of a slope). This makes it easy to sit on the sides and work without standing or squatting. there is a path around the bed (that is to say, there aren't gardens immediately adjacent, allowing for easy access from all sides). This bed isn't 100 percent wheelchair accessible because of the slope and the unpaved path around the garden. But Tara is able to wheel to the garden and, because she is able to get around on crutches, can access the rest of the bed when she needs to. Tara showing Jay the kale (behind the tomato plants). Tara and I pruned the tomato plants, removing suckers to improve fruit production and removing the lower branches and leaves to delay the inevitable blight later in the season. What a lovely way to spend a Sunday evening -- in the garden with a friend! We're having practically drought-like conditions in Wisconsin. But you can still overwater your tomatoes (and the rest of your garden for that matter). All the reading I've done says that at this stage in the growing season, you need to soak your plants with an inch of water (remember rain gauges?) once a week. Overwatering will produce leafy plants with little fruit and can weaken plants. Here's a great article explaining blossom-end rot and what can and can't be done to prevent it. 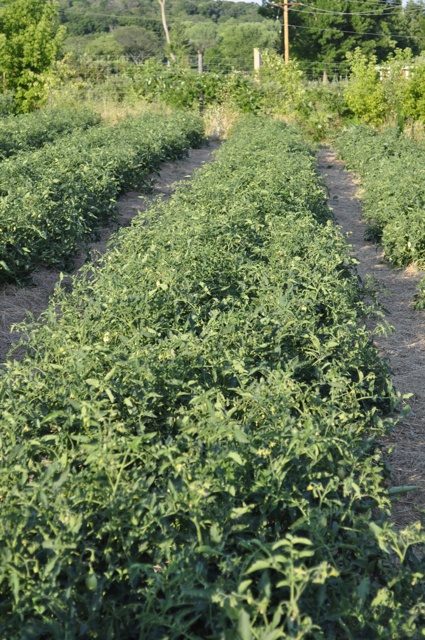 You can help the soil maintain moisture by heavily mulching your tomatoes. 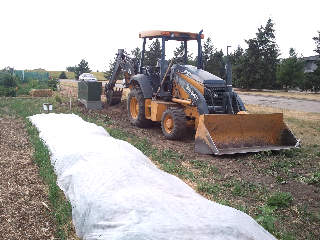 Our community garden provides bales of marsh hay for garden mulch. 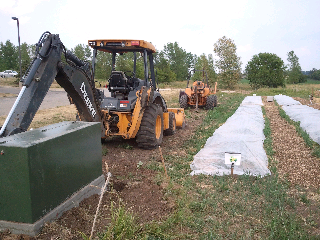 Use "slabs" of hay around the base of the plant to both maintain even moisture between watering, to protect the soil from erosion and to keep weeds to a minimum. Straw, plastic and any number of other materials work as well. Wood chips are not good for annual plants such as tomatoes, wood consumes nitrogen from the soil as it decomposes, stealing it from your plants. Check out the rest of this excellent article on proper tomato watering techniques. I was in the garden at noon, watering, and there was nothing to be seen. After work, I arrive to find the new electrical junction box into huge pieces of construction equipment sitting on top of our ex- pumpkin bed.